As many things as you can buy for your newborn baby before he or she is born, there’s no guarantee you will be able to use any of them! A common issue that comes up is when your baby won’t sleep in his or her brand new bedside bassinet! Your baby likes to be near you and your scent, especially if you are breastfeeding. The smell of you is one thing that helps him feel more comfortable. You could try to sleep on the bassinet sheets for a couple of days or even walk around with them in your shirt while you pitter-patter around the house before putting them back on your baby’s bed. Your scent will be transferred to the sheets and may help him feel more comfortable when you put him a little further away from you in the bassinet. The SwaddleMe By Your Side Sleeper has a slight incline to it and can help your baby feel more secure and comforted. It’s easy to soothe baby by rocking the bassinet back and forth or turning on the vibrations. In addition, it is adjustable for beds of different height! Many of the families with which we work rave about the Rock-N-Play Sleeper! This sleeper lets your baby sleep at an incline and has vibrations and rocking capability. It’s very portable, so you can move it to a different room for naps or to grandma’s, which is a plus. 😉 This sleeper has been involved in just a bit of safety controversy. So, please, please, please if you decide this sleeper works for your family, be sure to always use the restraints each and every time you use it. And once your baby can roll, you’ll want to say bye-bye to this product right away. Be sure to read the manufacturer’s instructions very carefully. These incline bedside bassinets can be well-worth their money if sleeping flat is the main reason your baby won’t sleep in the bassinet. * Please note: The Rock-N-Play technically does not quite adhere to the American Academy of Pediatrics’ safe sleep guidelines which state your baby should sleep on a firm, flat surface. In our experience, many families use it as a sleep device because, let’s face it, when your baby is not sleeping, you will do just about anything to get some extra zzz’s. To adhere to safe sleep guidelines, you should know that the Rock-N-Play’s incline, at the time of writing this article, is too steep. This might mean gradually increasing time in it during awake periods as well as sleep periods. For example, if he currently will only sleep in it for 30 minutes, try increasing the time he spends in it to 45 minutes, then 60 minutes, and so on. In the end, what makes your bed “your bed” is the fact that our bodies become accustomed to it. When you sleep at a hotel, it’s just not the same is it? So, as long as your baby is allowed to sleep elsewhere, then what becomes their “bed” is not the bassinet. That might be your bed, your arms, or chest. 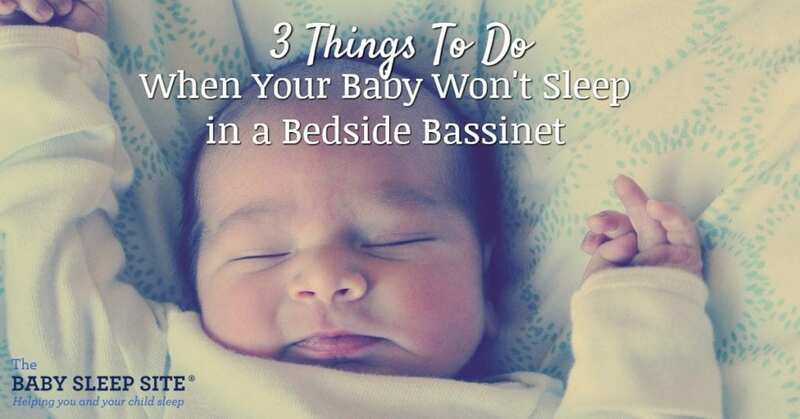 With concerted effort on your part, you can help your baby associate the bassinet as her preferred sleep space, even if it doesn’t happen in one sitting or one night. Just work your way up gradually! Of course, if your baby is outgrowing the bassinet, it’s possible it’s time to transition baby to a crib or cot. What has been your experience with a bedside bassinet? Sit up and cry along with my baby, just funny! I totally agree with you Janelle. Thanks for sharing useful info. Rocknplay does not meet safety guidelines for safe infant sleep and is not intended as a bassinet. Hey @Sarah, thank you for your comment about the Rock N’ Play. We have also recently come across more research that shows this as well, so we appreciate your comment so we are able to update the article according to more research. We do try to include information on all sleep solutions we hear families are using, and when we work one-on-one with families using them always have a word of caution for them, however with more recent research, we will need to update a word of “being careful” to recommending not using them for infant sleep. We are working to update our articles with it but as you can imagine since we’ve been around for a long time we have SO many articles and this can take a while, so again I appreciate your comment so we are able to update these. I have passed this on and it’s on our list. Thanks again for your input, we appreciate it! Patience is virtue with any baby activities. My little one hates sleeping likes to stay awake along with all of us lol. Anyways great article. Like the perspecitive and angle you went with. I shared it with my peers as well. @Shantanu – Thank you and please keep reading and sharing! I warmed up the bassinet with a hot water bottle an hour before bedtime and take it out when I put her in and it works like a charm. @Sam – Thank you for sharing – and so good to hear! Please keep reading and sharing! I totally agree with this topic. This is common issue I heard from mothers. You give us a lot of useful tips. Thanks a lot! @Julie Saldana, thanks for reading! Glad this was helpful for you. Thanks for reading @Chirs Campbell!